In the UK, 18% of girls and 5% of boys experience contact sexual abuse (one in eight children), and the figures are even higher for all kinds of sexual abuse. The mean age of onset is 9-10. Most children unlucky enough to suffer sexual abuse are unable to tell anyone, because they are terrified of the abuser’s power, have been threatened, feel ashamed, depend on the abuser, or are too young to understand it. The abuse often continues, the children endure horrific experiences and suffer long-lasting health, behavioural and social problems, and society suffers enormous socio-economic costs. Offenders get away with it and can continue offending. We see this repeatedly with prolific individuals and gangs: Rotherham, Rochdale, Savile, Oxford, Operation Yewtree. But it’s not just high profile casesthat matter: many offenders are family members and other acquaintances. What should society do to better identify cases at an early stage, interrupt the abuse, help the child, and identify the offenders? We should do what the scientific evidence tells us will get the best result. We should put the child at the centre of our debate. And we should do what an advanced liberal democracy in the 21stcentury that cares about its children would do. Mathews, B., Norman, R., Walsh, K., Bromfield, L., & Cheng, Q. (2017). 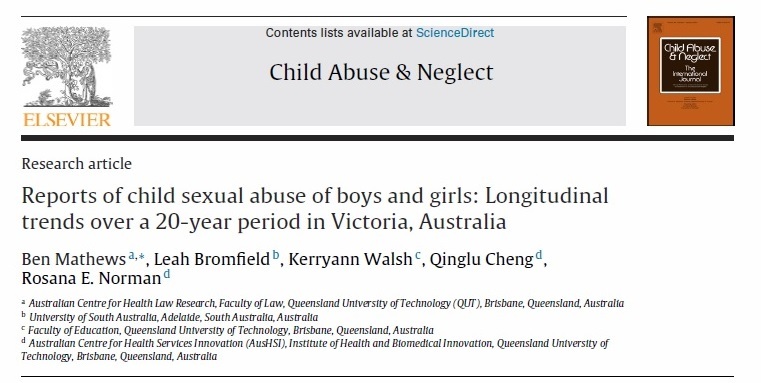 Reporting of child sexual abuse by child gender and age: a 20 year longitudinal time trend analysis in Victoria, Australia. Child Abuse & Neglect (in press, accepted 1 February 2017). The research indicates that as many boys as girls are sexually abuse in childhood. The importance of this evidence cannot be understated given the first paragraph in the article above, written by Professor Mathews on 23.3.16.